US Department of the Navy, “Navy Department, World War I,” Histories of the National Mall, accessed April 22, 2019, http://mallhistory.org/items/show/403. For more than five decades, the Main Navy and Munitions Buildings dominated the scenery along Constitution Avenue for a third of a mile west of the Washington Monument. 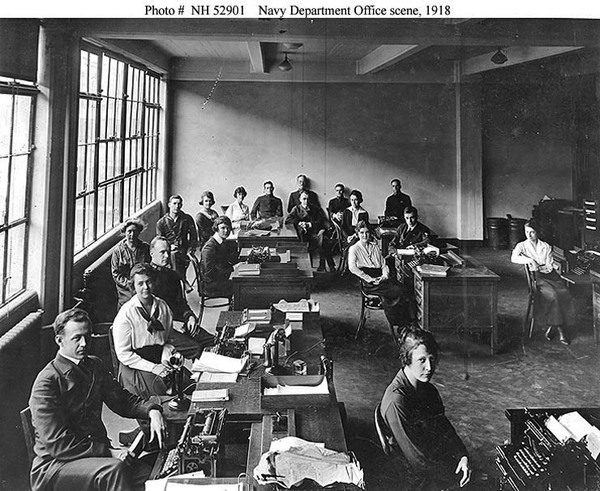 Erected in 1918 as "temporary" office buildings to support the vastly expanded World War I military, more than 14,000 military and civilian personnel worked there. Clacking typewriters, ringing as workers returned the carriage to start new lines of text, and jangling telephones echoed in the community work space. Naval Historical Center, Washington, DC . View original.